The French Crop; it’s the classic go-to hairstyle for any man looking for a low maintenance do that stands the test of time. The French Crop has adapted and evolved over the years; taking influence from the more refined Ceasar haircut for men. However, the classic French Crop as we know it still remains the same. 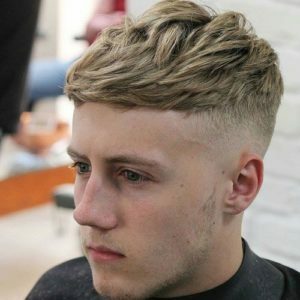 It is one of the best haircut styles for men as it is well suited to a range of different hair types and suits a range of men of any age. Simply put it, this popular chop is a short back and side with a contrasting length on top. It is similar to the Ceasar cut but is worn slightly longer and is feathered around the front. It is popular to have a textured top that can be styled as a short fringe, swept across or style into a loose parting. Favourable choices for this cut feature a choppy sawtooth effect that is achieved by a sharp point cut, whilst another option is blunt cutting for those hoping for a neat and solid shaped fringe. It is preferred by many as the cut requires minimum hair growth, with about 1-2 inches being needed for a fringe. Even better, it can be regularly maintained with cuts every 6-8 weeks. Similar but different to the popular French Crop haircut, the Caesar haircut features short hair on top and on sides, with often a very blunt fringe rather than a longer fringe on top like the French do. The military cut is one of the classic men’s hairstyles that never go out of fashion due to its iconic simplicity. It gets its name famously from Julius Caesar who used to sport the look in the Roman times along with his close acquaintance Marc Antony. 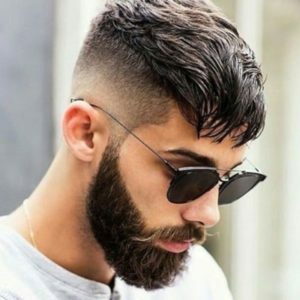 The men’s hairstyle has changed over time, as originally the style was layered the same length all over with the bangs cut very short and horizontally. To achieve a Short Caesar cut with low bald fade, the hair need too be taken much shorter all over. The cool style is defined by a harsher blunter cut that is taken very short on the top which is then complimented by low faded sides. This haircut will suit those who want to opt for a minimal feel. As we know, everything adapts and changes; including haircuts too. With men’s hairstyles, the basic cut might stay the same but the style changes slightly over the years. The New French Crop cut that is popular now is a more modern take on the classic french cut. 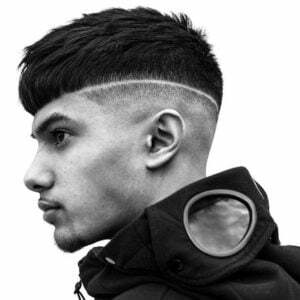 For a more contemporary French crop to be achieved, the back and sides should be taken even shorter to create a more contrasting, disconnected look whilst the top can either be kept choppy and long or cut into a blunt fringe. 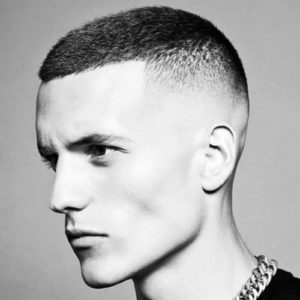 This new take on the French crew cut is characterised by having the hair longer on the top than on the sides, often taking the sides very short with a tidy undercut or taper fade. It is often recognised by the hair on top falling down as a fringe over the forehead or being swept to one side depending on the length. Ultimately, this trendy look it is all about creating a striking difference between the hair on top and on the sides to keep it easy and stylish. One of the best things about the French crop cut is that it can be suited to a variety of different hair, types and lengths whether that be curly, straight, shorter or longer. 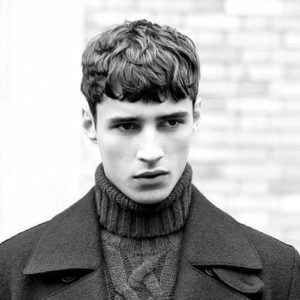 For men with curly or thick hair, there are many ways this french cut can be styled in order to suit this hair type. The textured, choppy look on top works well for those with thick or curly hair as it is a good way of managing the weightiness of the hair whilst creating a cool and rugged appearance. 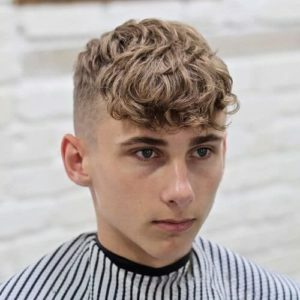 Keeping the sides as short as possible by adjusting the clippers for a closer cut whilst letting the natural curls fall down over the forehead is a great way to accentuate curly hair. After achieving an exceptionally close cut on the back and sides, this look can be enhanced even more with the use of products, to highlight the curls which will create a bold and striking impact. 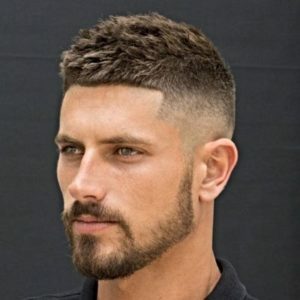 For those looking for a neater more military look, then consider reducing the weight of the curls on the top of the head and cutting horizontally on the forehead for a tidy shape. 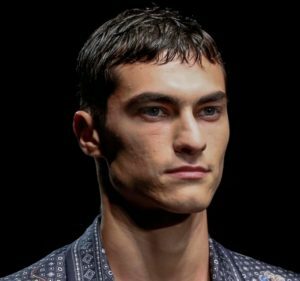 For guys with a straight or fine hair type, the French crop may be the perfect go-to haircut for you as it doesn’t require a lot of hair to achieve the look. Straighter, finer hair works well for the contemporary caesar style french look as the hair may naturally already be very fine on top, which makes it convenient as this is a short hairstyle. If the hair falls straight down the forehead, then chopping a horizontal blunt fringe and fading the sides will compliment each other well. Creating texture on top by chopping the hair and sweeping it to the side will add volume to the French crop. 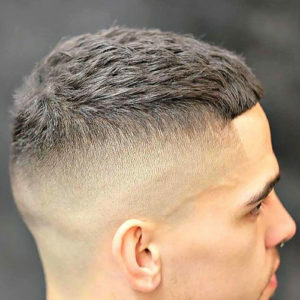 Alternatively, a mid to high skin fade will work well for straight or fine hair paired with a short cut on top that can be swept over the hairline. This style can be easily maintained with product to keep the hair looking slick and in place all day. The French Crop in its variety of different styles has been famously sported by many celebrity personalities. Take That’s frontman Gary Barlow is known for wearing his hair in the french cut style. He puts a modern spin on the classic French style, taking the sides very short allowing scalp exposure and varying the length on top. 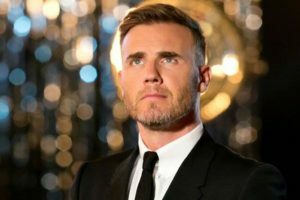 Differing the length on top allows more room to play around with styles, Gary Barlow often mixes his up sweeping it to the side, or to the back. 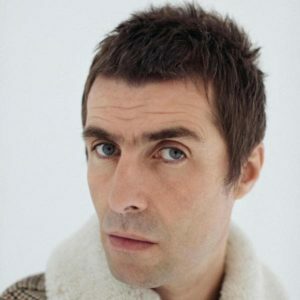 Liam Gallagher also iconically sports a Caesar-style French Crop but adds a mod twist by keeping the sides longer than usual. 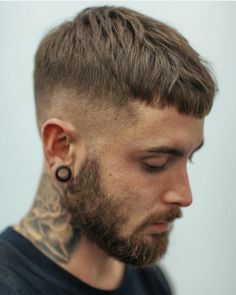 This look recognisable look that can be achieved by growing the sideburns out long, chopping a length caesar-like fringe and lightly feathering the top. For something a bit edgier, the traditional mod hair can be achieved with straight or fine hair by keeping the fringe short and emphasising the feathering. What products will help achieve this loo? Be sure to choose the right product for you depending on the style of cut you’ve decided to go for. 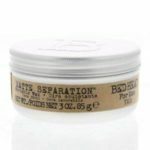 Try ‘Tigi Bed Head for Men matte separation workable wax” which works for all hair types and will help achieve the swept over textured look on top. For those looking for a cleaner and neater shape or sharp caesar cut or those looking to style a blunt fringe then the ‘Jack Black Wax Pomade’ will do just the trick. This product offers a strong hold and natural shine finish. Finally, for guys opting for a more natural look, or those with curly or thick hair then look to the ‘Fudge Think Big Texture Spray’ to build a mass of volume and create a dishevelled effect.